Situated amid 40 private acres of beautifully landscaped grounds at the edge of the quaint village of Adare, Co. Limerick, Woodlands House Hotel offers an idyllic setting for your vacation. The hotel features the indulgent, award-winning Revas Spa and luxuriously appointed accommodations. Activities abound for kids at this family-friendly hotel. 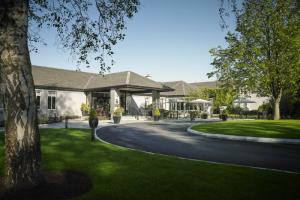 Located about 3 miles from Adare Golf Club and Adare Heritage Centre. Fieldings restaurant, Timmy Macs Bistro - traditional Irish cuisine. Adare Golf Club, Adare Heritage Centre, Limerick Racecourse, Cresent Shopping Centre, St. Mary's Cathedral.